“How are you feeling about the future?” Torontonian filmmaker Brett Story asks this question over and over to citizens of all five of New York City’s boroughs in her climate change documentary The Hottest August. At Copenhagen’s international documentary film festival CPH:DOX in March, four very different films offered – with varying degrees of optimism – their own responses to the question mark that hovers over our future. Here’s Dazed’s take on each. 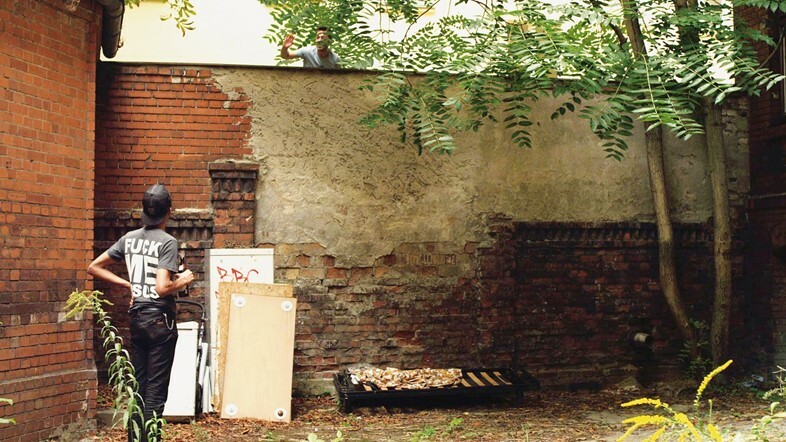 In a dilapidated, mostly deserted mid-19th century courtyard in Berlin, Matthias Lintner’s camera looks left and right, up and down, and straight on, locking eyes with the artists, punks and weirdos who have been squatting in the apartment building at the heart of his debut feature, Property. Lintner, who also spent a stint living in the building, essays the idea of home, asking at what point a space can be claimed as one’s own. “Space is a doubt: I constantly have to mark it, to designate it,” says Lintner’s voiceover, quoting French essayist Georges Perec in his 1974 book Species of Space, suggesting that the act of emotionally graffitiing feelings and memories on rooms and corridors, balconies and rooftops is as much a way of ‘marking’ a space as paying rent. “Ugly, cold, hostile and mean” is how Lintner’s voiceover describes modern stairwells, designed to discourage loitering. Here, encouraged by the building’s more sociable architecture, this community of strangers share cigarettes and backyard screenings. But while Lintner finds poetry in the Linden blossoms and empty bottles that litter the courtyard, in the dingy hallways tagged with graffiti and a dirty mattress shoved unceremoniously through a downstairs window, his perspective on this model of living isn’t entirely romantic. The apartment’s tenants, an oddball collection of slurring drunks, eccentric pensioners and unsuccessful musicians face imminent eviction; the film is curious about their future, and sceptical about their decision to opt out of society. Lintner shows the ways in which a system (or rather, the rejection of it) that seemed modern and anarchic in the late 1980s, after the Berlin Wall fell, is now itself crumbling. If radical artists can’t live cheaply, or better, for free, where will they go, the film asks. And if they move from the city’s fringes, will their work drift towards the centre, or disappear completely? 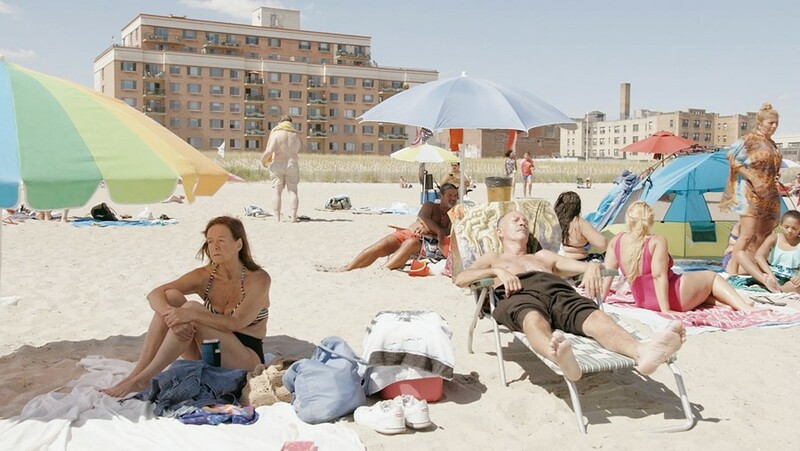 In The Hottest August, Brett Story’s sublime, febrile polemic about climate change, she spends a summer in New York City, mapping the city’s shifting geography and interviewing its residents about how the fault lines of their feelings have changed, too. “Everybody wants jobs, but nobody wants to work,” comments a middle-aged husband and father living in Suburban Long Island. On Rockaway Beach, an Environmental Science graduate came top of her class but can’t get a job in her field, and so has started her own small business as a dog sitter. Two older men clink beers in a Brooklyn sports bar, hypothesising that a better word to describe racism is “resentment”. Both are white. The political climate, it seems, is heating up too, bubbling underneath the city’s surface like magma. “There is the scientific and ideological language for what is happening to the weather, but there are hardly any intimate words,” reads actress Clare Coulter’s voiceover, reading from Zadie Smith’s essay “Elegy for a Country’s Seasons”. But Story’s filmmaking is its own intimate language, creating an atmosphere of dread and urgency through its associative editing. A low hum of electricity buzzes throughout the film; its charged and otherworldly sound design implies the impending apocalypse. A handsome economist explains that “risk” can be calculated by multiplying “the probability of the harm by the magnitude of the harm”. Story weaves together the threat of climate change with “the flood” of rampant capitalism, asking what havoc the combination might wreak, if unchecked, on major cities all over the world. Jeremy Deller’s Everybody in the Place premiered at Frieze Art Fair last summer (“it’s a film that merits a far broader audience than afforded by by an art fair,” wrote The Guardian). Subtitled An Incomplete History of Britain: 1984-1992, it looks back at the past to predict the future, drawing a line that connects the hedonism of the 80s to Thatcher, new money and the rise of neoliberalism, and Brexit, telling the story of contemporary British politics through the prism of house music. A “performative and participatory lecture”, the film shows Deller spending an afternoon with a diverse group of sixth formers at a school in London, juxtaposing VHS footage of teens queuing for a rave dressed in gaudy windbreakers with footage of A-level students wearing uniforms and hijabs. The artist teaches the teens about Karl Marx, explaining how Chicago house music was a way of “seizing the means of production”, its creators making “a tougher version of disco, only less straight, and less white”. He shows them clips of The Hit Man and Her, a TV series on U.K. club culture hosted by legendary producer Peter Waterman, tracking how the country’s nightlife changed from “Britain as holiday camp” (Blackpool, circa the early 1980s) to ecstasy-fuelled Gabba raves (Coventry, less than ten years later). “There’s been a coup; the king of the producers has been deposed” he says drily. The music, Deller insists, hardened in the same way that people’s politics did. But the generation of students Deller lectures are joyful, clever, radical in their thinking, and optimistic. The film is screening at the Glasgow Modern Institute until 11 May. Even more optimistic is Swedish director Lina Mannheimer’s Mating. 23-year-old Naomi and 19-year-old Edvin individually agree to participate in Mannheimer’s social experiment, committing to sharing their social media with her, and filming themselves for a year. But when the pair meet (the documentary sets this up as fortuitous coincidence, though it’s unclear whether their meeting was by design), there’s a romantic connection. Edvin begins the film a virgin, and a romantic, used to linking with girls online more than IRL; Naomi is sexually experienced, and voracious, but wishes she could stand up for herself more with guys (“like if they cancel on a Tinder date”). Self-shot footage of their early dates, kissing on top of an Amsterdam rooftop at sunset (the scene cropped and filtered like a perfect Instagram image), is integrated seamlessly with their Facebook Messenger chat logs. Like in all of the best romantic comedies, there’s lots of delicious tension and miscommunication; romantic gestures are made, people are blocked (and unblocked), and in one perfect scene, the hopeless, hapless Edvin becomes a meme waiting to happen when he whistles “Lonely” (Bobby Vinton’s original melody, presumably by way of Akon) while grilling vegan sausages in Naomi’s garden on her birthday, while she’s inside with her friends. Mannheimer finds tenderness in the couple’s willingness to be vulnerable on camera, and to share themselves with each other; it’s both hilarious and genuinely touching to see Edvin typing Naomi a love letter, while crying into a bowl of cereal. The film is giddily excited about the way the futuristic technology of the internet opens up opportunities for connection, cultivating love, friendship, and intimacy.